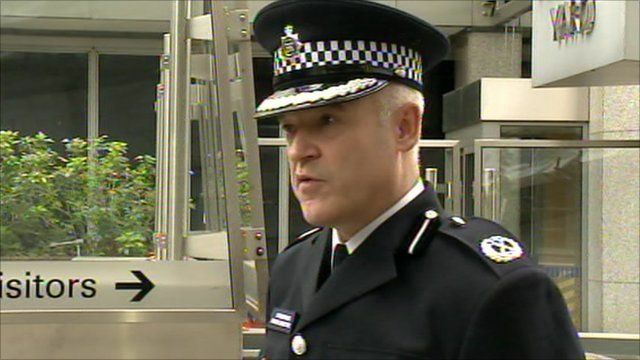 Police: Riots 'could not be anticipated' Jump to media player Commander Adrian Hanstock, from the Metropolitan Police, said 26 officer had been injured and 42 people had been taken into custody. Amateur video of Tottenham clashes Jump to media player Two patrol cars are attacked and set on fire in Tottenham, north London, following a protest over the fatal shooting of a local man by police. 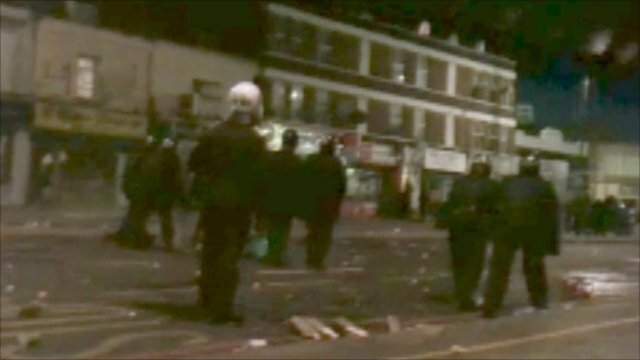 The Home Secretary, Theresa May, has said she "condemns utterly" the riots in Tottenham in north London. Shops and homes were looted and set on fire, and police patrol cars and a double-decker bus were also set alight. The disturbances began after about 200 people gathered outside a police station to protest about the death of a man, Mark Duggan, who was shot by officers on Thursday. Commander Adrian Hanstock, from the Metropolitan Police, said 26 officer had been injured and 42 people had been taken into custody. He said the violence could not have been anticipated.